Sentwali Bakari, vice chancellor, Student Success, prepares for his flu shot at the Health and Wellness Fair. Employees can receive free flu shots during two October clinic sessions on campus and students can receive $20 flu shots through the Wellness Center anytime during the year. 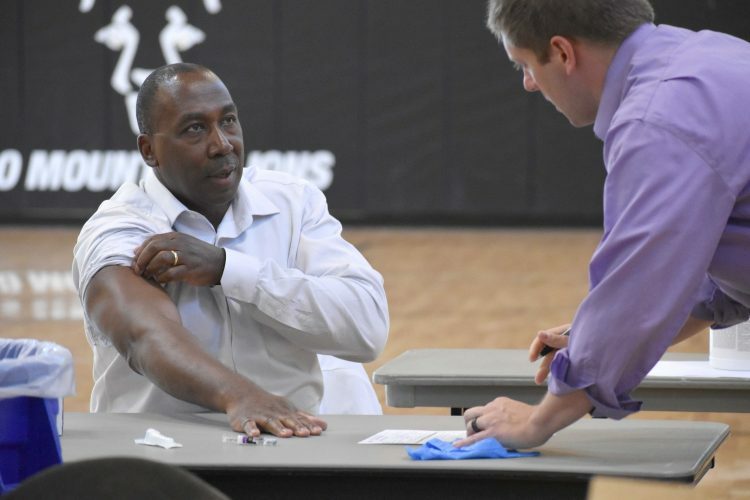 Kaiser Permanente is offering free shots to all UCCS faculty, staff and spouses. Clinics will be held from 9:30 a.m. to noon Oct. 18 and from 1:30 p.m. to 4 p.m. Oct. 24 in University Center room 303. No registration is required. CU Health Plan members are eligible for free shots through their primary care provider. Visit the CU Employee Services website to find a provider. Students can receive flu shots for $20 at the Wellness Center. Call (719) 255-4444 to schedule an appointment or walk in between 9 a.m. and 4 p.m., Monday through Friday. Each year, between 5-20 percent of the U.S. population contracts the flu virus. Read more about this year’s vaccine.